Ultra Violet: What Do You Think About the 2018 Pantone Color of the Year? 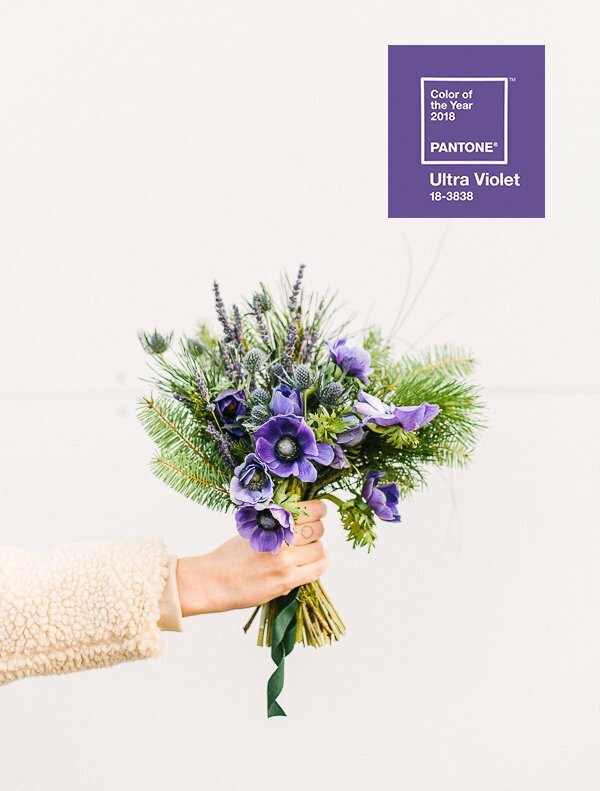 Ultra Violet has been named Pantone’s color of the year for 2018. And I’m…well…not a fan. Are you? I mean purple?! Ultra Violet is basically just a fancy term for purple, isn’t it?! Throw me a dusty lilac or a pastel lavender and I can probably get on board. But purple, PURPLE?! Nope. I’m not sold. I do think the meaning behind the color choice is interesting and even inspirational, don’t get me wrong. Ultra Violet suggests the mysteries of the cosmos, the intrigue of what lies ahead, and the discoveries beyond where we are now. But from a design point of view, I’m just not there yet. I am, however, up for a challenge! And doing my best to embrace it (if I can). Even if it does look like someone took the eye dropper tool straight to a photo of Grimace himself (Ronald McDonald’s big purple BFF). 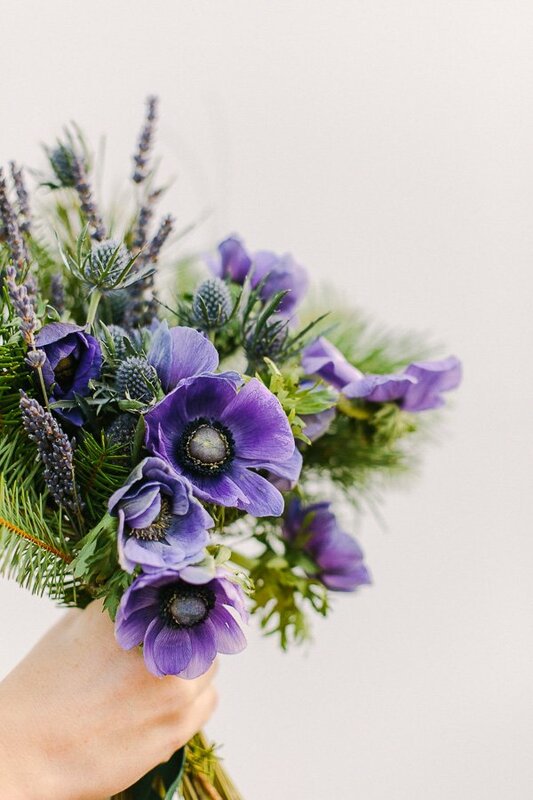 So, I put together a DIY floral bouquet decked out with violet anemones, lavender, and thistle in an effort to convince us all that maybe Ultra Violet isn’t so bad. I’ll just tell you now that I totally forgot to take photos of the ‘during’ process of this bouquet. Maybe we can just chalk it up to not quite back into the swing of things again, yet? 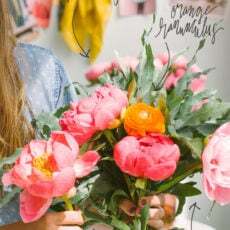 But the process I used for creating this bouquet is very similar to this tutorial: how to make a beautiful DIY floral bouquet. Just cross the stems to form an X over and over again, being sure to work your way around the perimeter as you go. 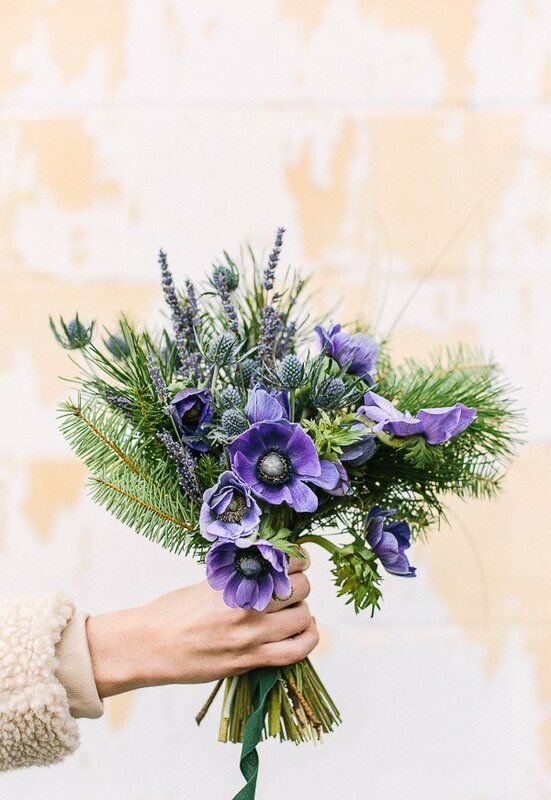 Add filler (lavender, thistle, and greenery) once some of the larger blooms (anemones) are in place, then continue adding more stems of varying flowers until the bouquet feels full and balanced. What’s the flower recipe for this one? 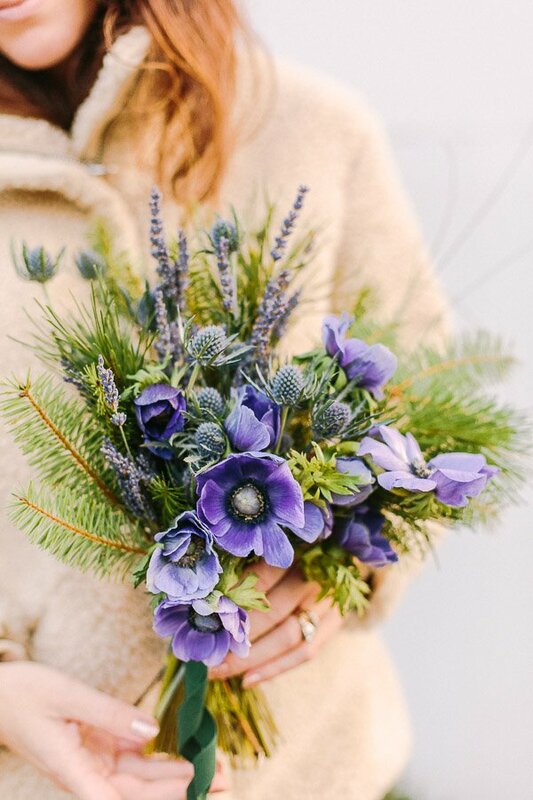 There’s dried lavender (which smells amazing), violet anemones, blue thistle (which looks like purple) and a little holiday greenery to tie in the winter months that don’t seem to be going anywhere. It’s been SO cold in Atlanta this week. 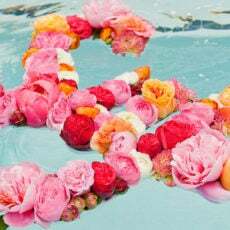 Okay, so after all those obligatory flower photos….I’m SUPER curious to know what YOU think of Pantone’s color of the year?! Do you love it or hate it? No judgement either way. Just want to know what your reaction is. Or if you even care one way or the other?! Let me know in the comments below. It looks so pretty! I love the color. Yeah, I definitely like it best as a flower…won’t be painting my walls ultra violet anytime soon. I feel like the color of the year has been some shade of purple for a while now… like they keep TRYING to get us on board with purple and the entire world keeps saying, eh…. no thanks. Wasn’t it orchid last year? I’m not a huge fan. HA. 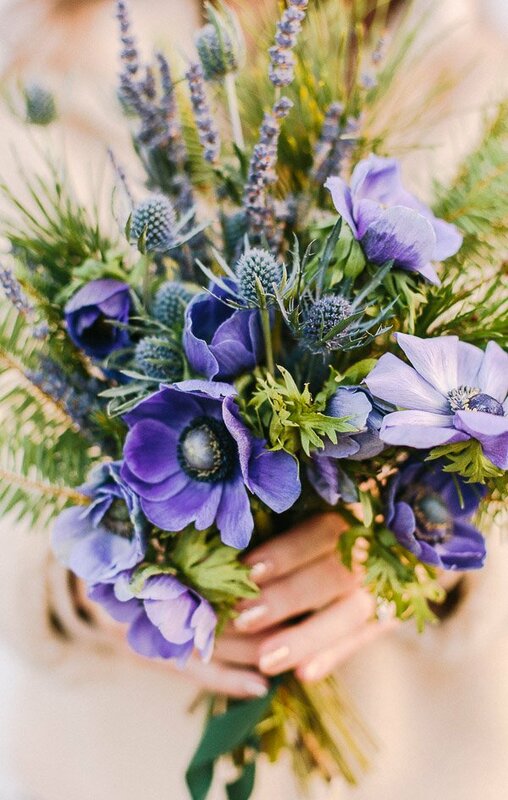 Point taken, but from looking at your stunning bouquet the colour looks incredible against a back drop of green! Such a beautiful contrast. Thanks Pink Pineapple. 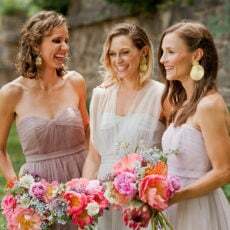 Carole – are you loving the 2018 color than? I just realized (with some help from Amy), that some shade of purple has been Pantone’s Color of the Year four times in ten years. That’s a lot of purple. Haha. Great for people who love it though. Love love love it! Purple in any shade is a favourite of mine. I like the color but I don’t see it that often. The color is so beautiful. Will definitely do this on weekend. I love purple and I have since I was a kid. However, for about a decade you couldn’t find purple shades of clothing at all (I’m thinking the early 2000’s). Last year the color was greenery. Green looks beautiful on my daughter with her green eyes & blonde hair. I was all in and made a bunch of silk scarves in shades of green that I sell every year at a farmer’s market. I sold very few green scarves if any but meanwhile, turquoise & coral have been popular for five years. I guess it takes a while for colors to catch on. I think that instead of being upset that you don’t like their color of the year, we should be upset at the lack of color variety. Hi Lisa. Totally not upset about the color of the year, just voicing my opinion of not being a fan of the color. 🙂 BUT you bring up a really good point about the lack of variety in the last 10 years. To have some variation of purple 4 out of the last 10 years is quite excessive. I don’t get it. one of my favorite colors, I even painted my bedroom this color with pale yellow trim, soothing and relaxing. I can definitely see the soothing qualities of a lighter purple (more lavender color), but do you find Ultra Violet Relaxing? It seems like a much bolder purple than what I would typically put in the relaxing category. Might just be me though. 🙂 Really appreciate you sharing your thoughts, Barbara. I dont like so much also this color, but in little detais its so nice! I love that color! I use it a lot in my artwork, and purple and lavender flowers are on top of my list. However, I don’t decorate my home with purple except in some art pieces. My palette is more in yellows, blues, terracotta, with some green. I do wear it and love jewelry with purple stones or crystals. I make jewelry, so I will be using more purple this year! I never cared for purple until I became a flower gardener… then I gained newfound respect for it and even bought a sweater in a deep, rich shade. I’ve had strangers stop me to compliment it, so you never know!